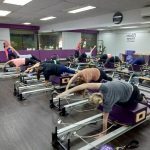 Pilates Jumpboard Class is a fast paced, high intensity Pilates workout that challenges your coordination and core stability while enhancing calories burn. We replace the Pilates Reformer footbar with a special vertical board. You will jump from the board while lying down on the Pilates Reformer. Pilates Jumpboard gives you extra cardio boost during your Pilates class. For those who find regular Pilates classes too “slow” for comfort, the Pilates Jumpboard will give you a lovely surprise. Pilates Jumpboard is perfect for clients who wants calories burn and body sculpting in one class. However, this class may not be suitable for people with knee and ankle issues.